In the late 1800s, Charles Spurgeon warned that the Church was drifting away from the purity of the Gospel. Instead of boldly proclaiming the truths of Scripture, Christians were candy-coating the Word, being careful not to offend anyone. As a result, Christianity’s influence in nineteenth-century England was severely weakened. 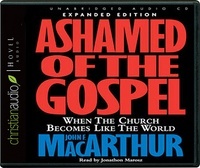 Now, 100 years later, John MacArthur is sounding the same alarm. And it’s a warning the Church just can’t ignore. The signs of compromise are all around us: Numbers have become more important than the message. Churches are offering up “Show-Time” religion instead of the “Old-Time” religion. Pastors have turned to the marketing industry to help them draw people in rather than relying on the sovereign power of God. Until all that changes—until we return to our calling to go into all the world and preach the Gospel without shame—the Church is in danger of losing its impact on society. And that would be our generation’s greatest loss.